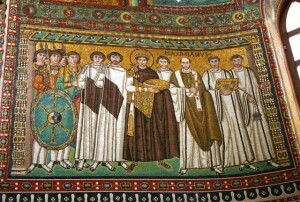 Ravenna is one of the most amazing places I have been fortunate enough to visit. I was so bowled over the first time we went there that this year we went again, and if you haven’t been yet, don’t leave it too long before you go! 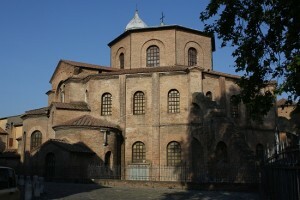 For me one of the best places was the Church of St Vitale, the patron saint of Ravenna. The building was begun in 526 and finished in 547 – an amazing feat of craftsmanship in just over 20 years. 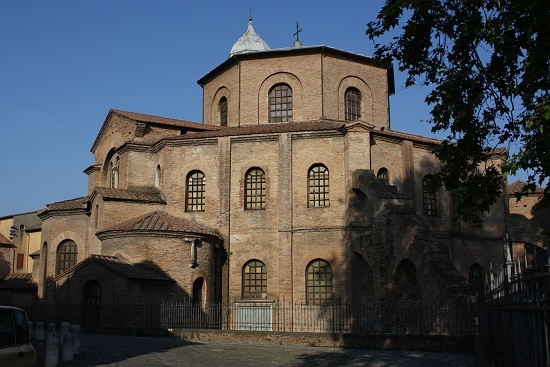 It is octagonal in shape and is a mix between Roman styles (dome, shape of the doorways, etc) and Byzantine styles (the capitals to the columns and narrow bricks). 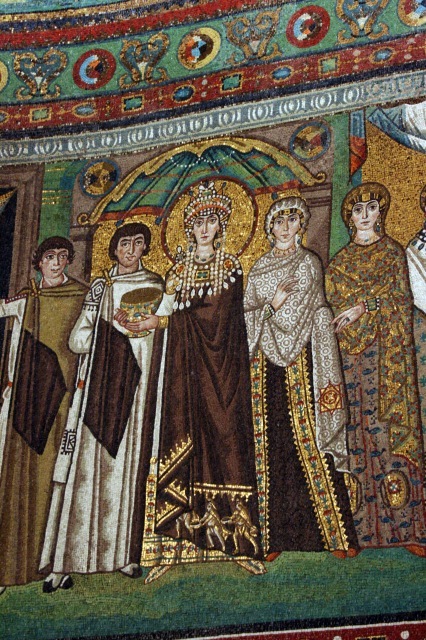 It is the mosaics that are the most spectacular though to me, and perhaps the most famous is that of the Emperor Justinian and his court to the left of the high altar, and his Empress Theodora opposite him. 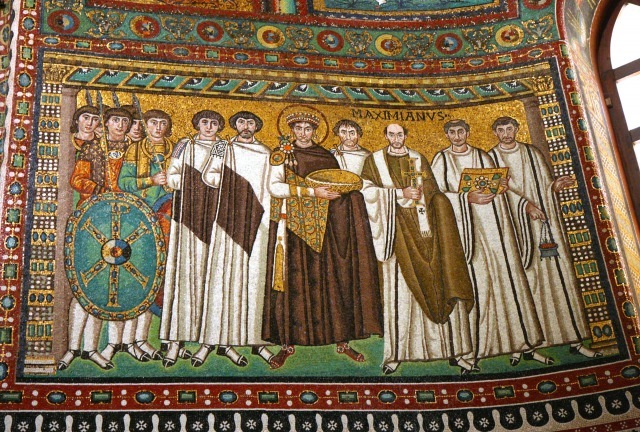 Justinian is wearing a deep Tyrian-purple robe, dyed from a liquid which comes from the murex brandaris mollusc. Each sea creature gives only one or two drops and it’s been estimated that 12,000 molluscs were required to dye a single robe. It’s easy to see why the colour was restricted to the most important people and even Roman Senators had only a broad purple stripe on their white togas! 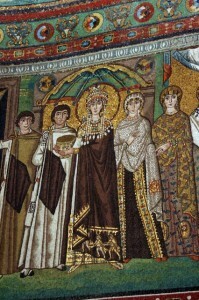 The Empress Theodora with her court is depicted on the wall opposite her husband, and she is dressed in a rich purple cloak, but this time hers is embellished with a gold pattern and figures processing at the base. As her hand reaches out to hold the gold and jewelled bowl, it pushes her robe aside to reveal a white dress with a magnificent gold thread and coloured border. Of course, all this decoration, the expressions on the faces, and the richly patterned dresses and headdresses are not painted, but are mosaics. The workmanship is simply incredible! Look particularly at the patterns on the clothes of the woman on the right in this picture. 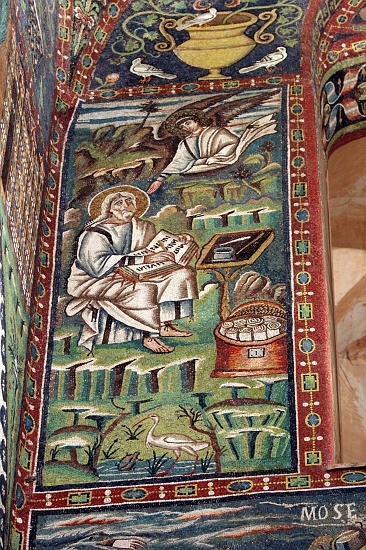 It is interesting in such an old church to see within the mosaics, if you look closely, examples of writing equipment – perhaps an indication of the importance of the written word to Christians. 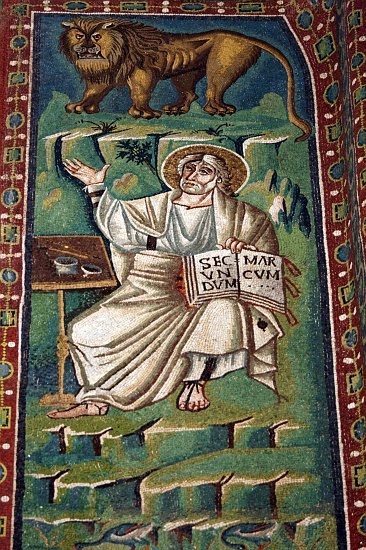 The man to the right of Maximianus in the Justinian mosaic above is holding a jewelled book (more on Golden Books), but there are also images of writing paraphanalia. Here is John the Evangelist holding an open codex, and beside him on a little pedestal table is his quill, quill knife, ink pot, and probably an ink horn. Note the red tabs on the book which are just dropping down. These were used to secure the bouncy animal-skin pages when the book was closed. Quite a few manuscript books had hasps and clasps, though not all have survived still attached to the binding. In this mosaic the Evangelist Luke is pointing to his symbol, the calf (though looking more like a full grown bull here! 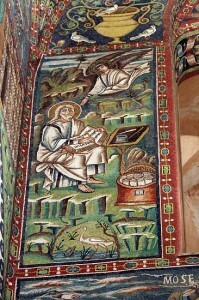 ), and holding his Gospel. You can make out the hasps and clasps a bit better here. At his feet is what looks a bit like a hat box with a strap to carry it. In fact this was a container in which to keep scrolls, as you can see they are tightly wound and stacked vertically inside – and remember that all of this is made up of tiny pieces of tile. The Evangelist Mark indicates a very ferocious lion as his symbol, and again, on a pedestal table, are his quill, quill knife, ink horn and ink pot. And lastly, here is Matthew with his winged man symbol. 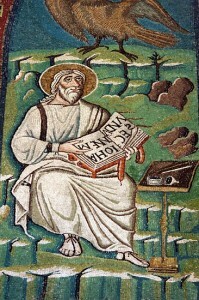 Perhaps rightly so as the first Evangelist he has both writing equipment and a box of scrolls. Note the lock on the front of his scroll box. 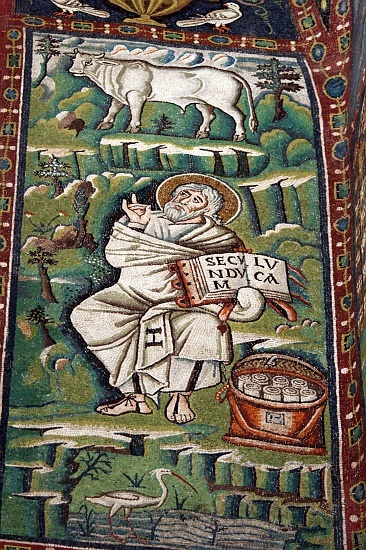 This entry was posted in Blog, Craft, Historical building and buildings and tagged books, Emperor Justinian, Empress Theodora, Golden Book, ink, ink horms, ink pots, mosaics, pens, quill knife, quills, scrolls, St Vitale Ravenna on 4 December 2013 by Patricia.